SeaGen could generate up to 300MW by 2020. An energy company has announced it wants to deploy underwater electricity turbines in the Pentland Firth. Marine Current Turbines confirmed it intends to apply for a lease from the Crown Estate allowing it to install 300 megawatts (MW) of capacity by 2020. 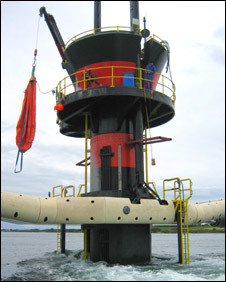 The firm has already deployed a similar tidal energy system in Northern Ireland's Strangford Lough. The Crown Estate announced in September it was to lease the bed of the firth to developers who want to generate power. The firth, between the Scottish mainland and Orkney, contains six of the top 10 sites in the UK for tidal energy. It is hoped its power could be harnessed to generate 700MW of electricity by 2020 - enough for about 400,000 homes. Marine Current Turbines said it believed its SeaGen technology could generate up to 300MW or more by 2020 if the local grid could take it. SeaGen works in principle much like an "underwater windmill" with the rotors driven by the power of the tidal currents rather than the wind. Martin Wright, managing director of Marine Current Turbines said: "We welcome the Crown Estate's competition for the Pentland Firth. "Given our experience with our SeaGen tidal project in Northern Ireland's Strangford Lough, we believe that we have a clear and substantial technical advantage as well as unique, practical experience of installing and running a commercial-scale tidal power system. Mr Wright said that, subject to financing and securing the necessary approvals, the company wanted to initially install up to 50MW of capacity in the firth by 2015, before increasing that to 300MW within a further five years. But he warned: "Harnessing the power of the Pentland Firth will be challenging and there are still substantial issues, in particular financing and grid connection, which will have to be addressed. "However, the move by the Crown Estate is a significant and welcome step forward if the UK is to harness the sea's energy potential on a truly commercial basis."